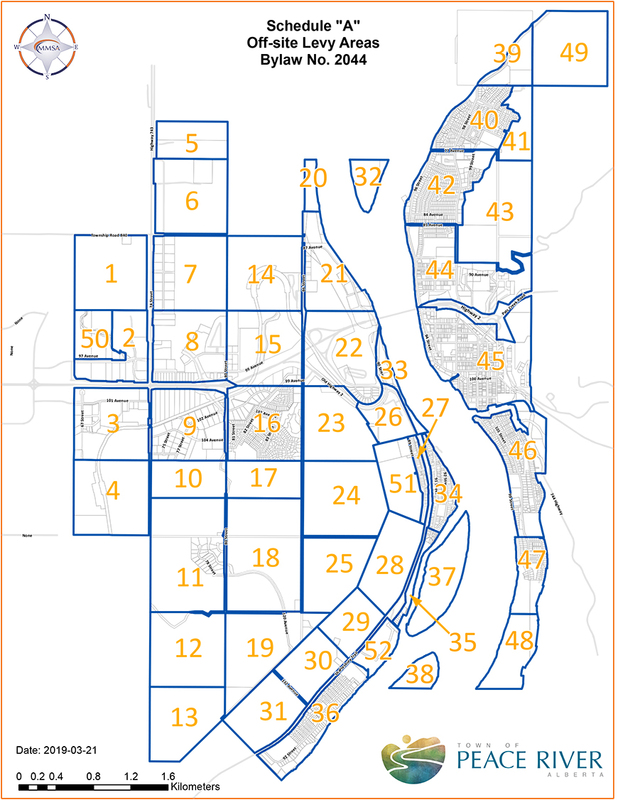 The Town of Peace River has been working on an update to the off-site levy model that establishes the Off-Site Levy rates. In addition, the Town is proposing key changes to the associated bylaw and policy. Key changes are summarized below. Once the new bylaw is adopted and policy is approved, the updated Off-Site Levy rates will apply to any new development or subdivision applications where the Off-Site Levy is imposed. The monies collected by the Off-Site Levy are used to build infrastructure that supports the new developments. The basic principle behind the Off-Site Levy is that growth pays for growth. The existing Off-Site Levy bylaw, policy and model can be found on the Town’s website. The proposed Off-Site Levy Policy is available here. The proposed Off-Site Levy Bylaw is available here. Pursuant to Section 606 of the Municipal Government Act, being Chapter M-26 of the Statutes of Alberta, notice is hereby given that the Council of the Town of Peace River will hold a Public Hearing before the second reading of Bylaw No. 2044 to replace Bylaw No. 1851 and amendments thereto, the Town of Peace River Off-site Levy Bylaw. Bylaw No. 2044 updates the off-site levy bylaw, ensuring consistency between the bylaw and the off-site levy policy. The Bylaw also adopts new off-site rates, based on the updated off-site levy model. The rates are reduced by a weighted average of 51%. Council will also consider updated Off-site Levy Policies which provides additional direction in the administration of the bylaw. Alisha Mody, Municipal Planner at P.O. Box 6600, 9911-100 Street, Peace River, AB T8S 1S4 Ph: (780) 624-2574, Fax: (780) 624-4664. Please forward written submissions on or before May 9, 2019 at 12:00 pm. The Town of Peace River hosted an Open House to provide the opportunity for stakeholders (developers, landowners, and residents) to give input on the Off-Site Levy Bylaw Update (Bylaw 2044). At the Open House the Town presented both the off-site levy model, which determines the rates, and the off-site levy bylaw. The basic principle behind the off-site levy is that growth pays for growth. The Town is looking for comments from developers, landowners, or residents that have an interest in these levies. If you were unable to make it to the open house please contact the Planning Department at (780)624-2574 or email Alisha Mody at amody@peaceriver.ca to if you have any questions. You can also submit a question via the form below. Bylaw 1851 has been amended twice since it was originally adopted. Bylaw No. 2044 is a new bylaw that consolidates the previous amendments and ensures consistency between the bylaw and the off-site levy policy. The full bylaw including the rate model can be found here. Section 7 Imposition of Off-Site Levy: the language in (a) and (b) has been updated from a “shall” to a “may”. This is consistent with the applicability thresholds in the Off-Site Levy Policy that identify circumstances where the Off-Site Levy would be not applicable. The current Off-Site Levy model is based on information up to the end of 2013. The rates should be updated regularly to ensure that they are generated based on best information available. The model is being updated to the end of 2017. The population projection over the next 25 years has been lowered based on the population projections that were generated for the Town by Nichols Applied Management as a part of the Intermunicipal Development Plan process. This information is the newest and most accurate information available to the Town. This change puts an upward pressure on the Off-Site Levy rates as the amount needing to be financed by new development is allocated to a smaller amount of population increase. New infrastructure projects have been added. This change puts an upward pressure on Off-Site Levy rates as the number of projects being supported (in part) by the Off-Site Levy increases. The percent of infrastructure projects allocated to new development has been significantly lowered. This change relieves pressure on the Off-Site Levy rates as the proportion of each project that being shown to be supported by the off-site levies decreases. In many cases this change is substantial and is consistent with lowering the population projection. The updated rates represented a weighted average reduction of 50.9% lower than the previous model. This change is principally the result of the percent of infrastructure projects that are allocated to new development. Off-Site Levy Policy P-61-06-D proposes a number of changes to the Off-Site Levy policy. The full policy can be found here. Stripping, Filling Excavation or Stockpile has been added as a threshold. These developments would not create any additional ongoing burden on off-site infrastructure. A Change of Use has been added as a threshold. A Change of Use does require a development permit but does not necessarily create any additional burden on off-site infrastructure. Subdivision or development where the lot is not connected to municipal infrastructure has been added. Residential development on parcels of land greater than 1 hectares where only a portion of the lot is being developed will only have then levy imposed on the portion of the lot that is being developed. Subdivision of Large Parcels of Land – the parcel size threshold for this policy is proposed to drop from 8 to 1 hectares. This means that land may be subdivided into smaller parcels before the levy would be imposed. This lowers the burden to potential developers by reducing the times where an Off-Site Levy over more than 1 hectares is required. For a full list of the applicability thresholds, see Section 4.1.2 of the policy. The deferral policies establish when a developer is eligible to defer a portion of the levy. The proposed Policy adds a second deferment threshold, when off-site levies are between $10,000 and $250,000 and lowers first deferral threshold to $250,000. 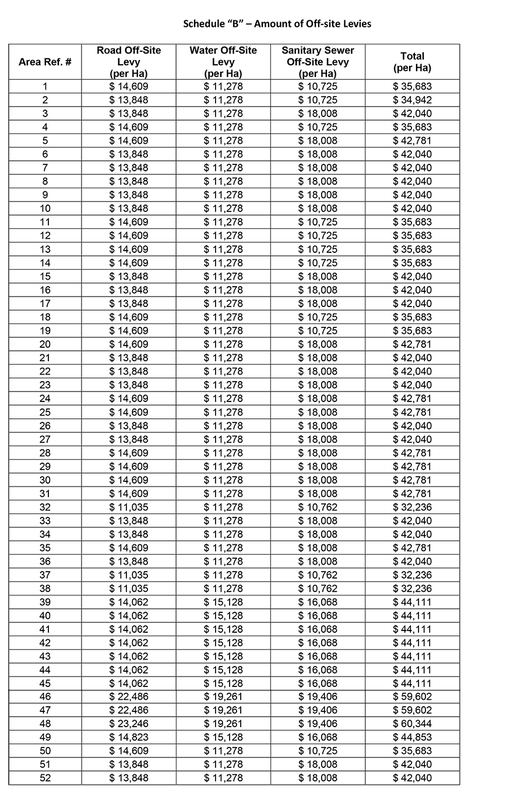 The required down payment is also lowered to 25% (from 50%). The proposed policy locks in the deferral amount, with increases based on interest charges only, rather than having it change with future rate updates. This change increases the certainty to the developer and the Town. The complete deferral policies can be found in Section 5 of the policy.